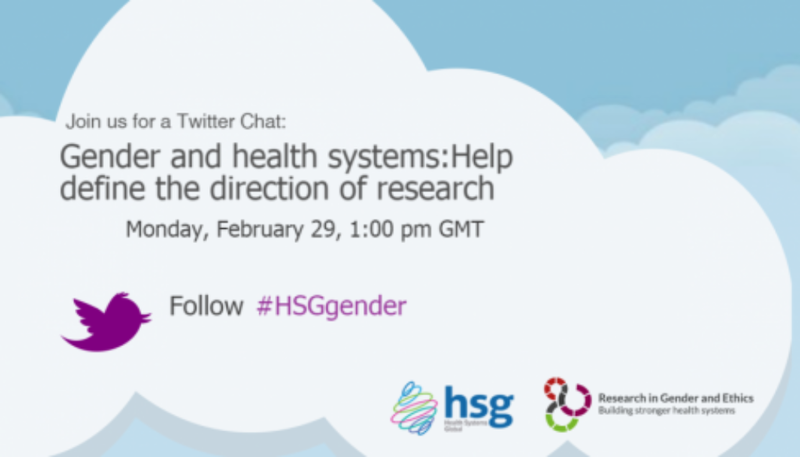 Join a live Twitter chat exploring the role of gender within health systems on February 29th! As part of the Health Systems Global (HSG) month of enquiry into gender, in the lead up to International Women’s Day, you are invited to participate in a Twitter chat which will be supported by Research in Gender and Ethics: Building stronger health systems (RinGs). The chat will take place on February 29, 2016 at 1:00 pm GMT and anybody who is working in the area is free to participate and answer the questions that will be given to panelists. The chat will be recorded in a Storify and circulated to the HSG membership. The next Symposium has a theme focused on “Equity, rights, gender and ethics: responsiveness through values-based health systems” and this is a great opportunity to start the conversation. In order for gender mainstreaming and gender analysis to succeed it must see how gender interacts with others axes of inequality such as poverty, disability, ethnicity, age, sexuality and geography. This means analysing the social context of inequalities and opportunities specific to each country or context, rather than assuming that the status of women, men, or gender relations is comparable across diverse societies and health systems. We hope that the chat reflects this. Of course many of the issues mentioned under the health systems building blocks interact and are mutually dependent. We’d love reflections on how gender relates to complex adaptive systems, and would like the active participation of all the Health Systems Thematic Working Groups and this may lead to the identification of a host of other cross-cutting issues. We would also like to see the twitter chat encourage submissions of abstracts to Health Systems Global conference 2016 (deadline 20 March 2016) where one of the sub-themes is “Equity, rights, gender and ethics: responsiveness through values-based health systems”. The chat will take place on Monday, February 29,2016 at 1:00 pm GMT. Follow along and join in the live discussion using the hashtag #HSGgender. If you are not able to attend, please feel free to Tweet your comments to@H_S_Global using the event hashtag. An edited summary of the Tweet chat will be published in a Storify post shortly after the session. This news item was originally posted on Health Systems Global.